Ankle weights strap around the lower leg for additional resistance during exercise. The weights are available in several sizes and styles, depending on the size of person and exercise requirements. Many use the weights to build muscle strength and improve endurance; however, they come with a risk that should be considered. Ankle weights are flexible fabric pockets filled with weight. Each weight has a strap that allows you to wrap unit around your ankle and affix in place for exercise. Ankle weights are available in a range of weights from 2 lbs. up to 10 lbs. Some styles are adjustable and allow you to add and remove weight to the pockets depending on your requirements. Purchase ankle weights that fit comfortably about the ankle, making sure the strap is not too loose or tight. Properly fitting ankles weights do not move freely or slide up and down the ankle. Weights that are too small for the ankle are snug and hurt during a workout. Wear the weights with socks to create a barrier between the weight and leg that limits irritation from sweat buildup or rubbing. Begin using a one, two or three pound weight and gradually increase the size as the legs build muscle. Ankle weights add strength training to your exercise session by making your legs work harder. Dr. Anthony Luke reports in a Los Angeles Times article that working the legs harder by wearing ankle weights increases exertion and benefits the cardiovascular system. He recommends you only use ankles weights if you have no joint problems or injuries, and that you avoid developing a problem by not using the ankle weights during every exercise session. According to Mayo Clinic, some people alter their gait to compensate for the extra weight on the lower legs. This alteration may cause you to lose balance or coordination while jogging, resulting in an injuring fall. 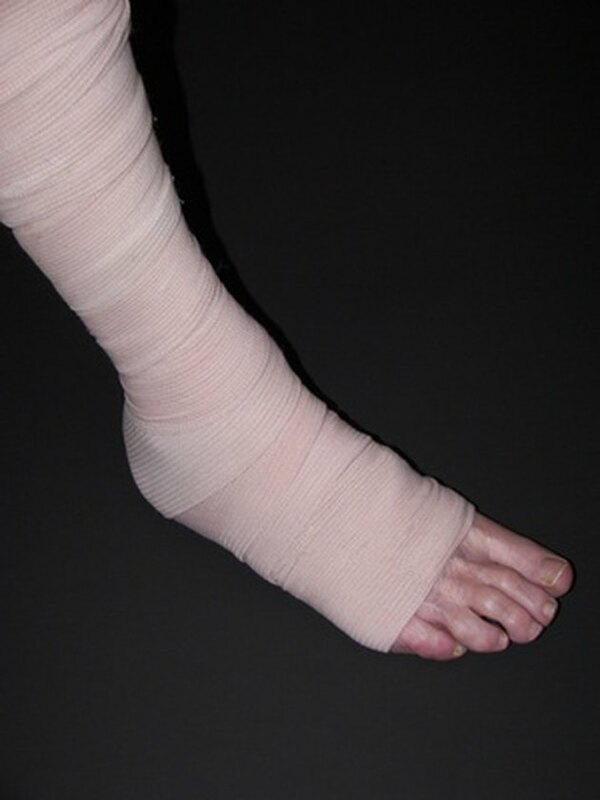 Health Guidance warns against using ankles weights to increase fat loss since the increased exertion burns carbohydrates for energy and not fat. Experienced runners with healthy cardiovascular systems have less of a risk of developing problems with ankle weights, since their legs are used to the shock placed on them while running. Use ankle weights to increase resistance while strength training instead of jogging. The National Institute on Aging recommends using ankle weights to increase resistance while performing leg raises, flexion and extension exercises. Increasing your jogging pace is an alternative to increasing intensity during the workout. A faster pace does not alter the gait, which lowers the risk of injuring your legs.